Microsoft Dynamics 365 is one of the cutting-edge customer relationship management tools. Though, it is brimmed with a plenty of useful solutions for a company, but Microsoft still keeps evolving the CRM to make sure that meets the demands of the current generation. In one of the recent releases of the solutions, the capability of the very valuable common resource scheduling was added. However, in the previous versions of the software, only the capability of scheduling resources was present in Field Service as well as the Project Service. However, the thoughtful addition of this wonderful common resource scheduling turn out to be very beneficial for the users. 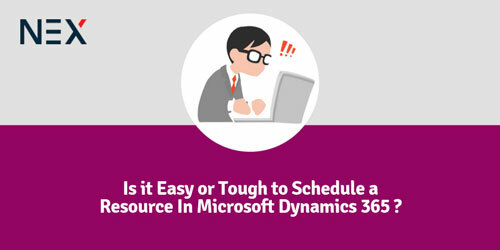 How is the new resource scheduling feature beneficial for the Microsoft Dynamics 365 users? Common resource scheduling is the latest add on feature which has made it possible for the users to make the bookings for any entity inside the Customer relationship Management section. This also includes custom entities. Plus, this makes it easy for the users to view all of them on a central schedule board. This can be done with any field service as well as the project service bookings. Common schedule board is definitely one of the most significant features of Microsoft Dynamics 365 services. It offers a complete overview of the availability of the resource. And, not just the resources, it even shows the availability of the bookings that the user can make. When the users installs the Field Service solution successfully, in that case the schedule board automatically depicts the work orders automatically, and by default. Not even that, the solution also has the features to help the users add a plenty of other entities. Also, if a user wishes to schedule the appointments too directly on the schedule board, they can do that as well. Resource Scheduling works hand in hand with the Field service. Only after the successful installation of field services, a user can expect to use complete features of this wonderful new feature. When it comes to the entities which are required to be depicted on the schedule board, the user has to easily configure the entity first. Also, the Schedule board, allows the users to see the work orders. You cannot just see all the work orders but, you can also see all the other entities by allowing the scheduling for each entity. This way, the process becomes a lot smoother. All the Field Service functions extend Dynamics 365 to offer a thorough Field Service management solution. This also contains things like customer assets, service locations, resource management, agreements, work order management, preventative maintenance, product inventory, purchase orders, analytics etc. These capabilities help the users to optimize all the service schedule. This is done through efficient routing, dedicated travel time as well as with proper and efficient resource skill matching. At the same time, it also helps the boost the first-time fix rates. Along with the increased on-time delivery performance. Field services is regarded as one of the best parts of Dynamics 365 services also because it increases the real-time communication and collaboration. Also, it enriches the collaboration between the customers, customer support, dispatch, field agents etc. Resource scheduling in Microsoft Dynamics 365 Integration Services is definitely easy. However, it only needs a certain amount of understanding. A person has to be well versed with the necessary tools to make sure that the resource planning and the resource scheduling is done effectively. Also, the users have to make sure that they are using the right features of Dynamics 365, and at the right time.